Why Did The Koala Cross the Road? Because It's Australia. There's plenty to fear in Australia: kangaroos fighting in the street, and about a zillion different things that'll kill you. But a koala bear strolling down a busy street? Just another day in the Outback. This week, one such marsupial was spotted strutting down a human-filled road in Portland, a popular town in Victoria, Australia. That beats all the breweries in Portland, OR, and Portland, ME, for originality. Hands down. 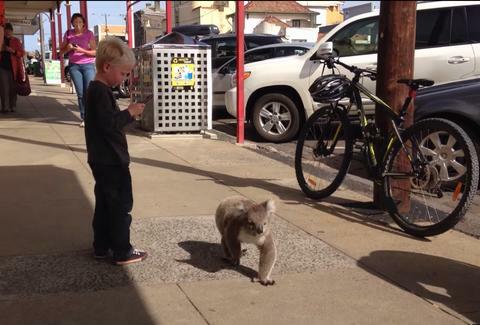 One lucky onlooker, Chris Kerrigan, spotted the bear as she enjoyed a cup of coffee at a nearby cafe. The koala marched down the road and wiggled its bottom, minding its own business. Clearly, the cuddly animal had somewhere important to be. But again, it's not as if this is out of the norm for Australia. Now seeing Russell Crowe behaving in public? Totally different story. Watch the koala strut its stuff in the video below. Chloe Pantazi is an editorial assistant on Thrillist's travel team. She really wants to cuddle a koala bear. Follow her on Twitter at @ChloePantazi.